The Last Supper is a sweeping historical epic with a giant cast of characters, each struggling for power or simply to survive during the fall of the Qin Dynasty in the second and third centuries B.C. We join Liu Bang (Ye Liu), the central character of the movie, as he is apparently on his deathbed. Once a commoner but now an emperor, Liu Bang has seen the highs and lows of life, and is living proof that kings are made, not born, a sentiment that echoes throughout the narrative of The Last Supper. Unfortunately for Liu Bang, his once sharp mind has crumbled, leaving him in the midst of a waking nightmare and not much more than a mad king. 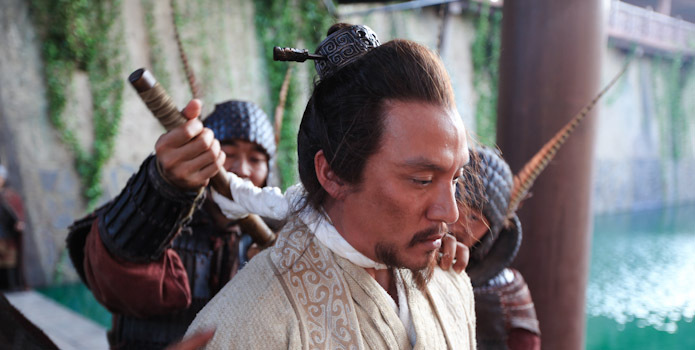 Perhaps even more unfortunate are the lives of the characters around Liu Bang, having dedicated themselves to him, he proceeds to weed them out one by one with the help of his heartless wife as his unstable mind conjures up imaginary ways in which they have betrayed him or could be a threat to his position as emperor. Those expecting the film version of a Dynasty Warriors video game should under no circumstances hope for something similar in The Last Supper. 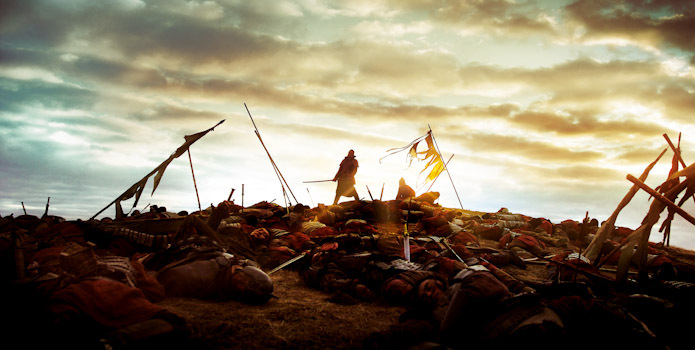 The movie is about the game of thrones that goes on behind the curtain of war and makes a point of not being just another period piece action movie. I had heard that Lu Chuan was a very visual director, and I had not been mislead. The Last Supper is easily one of the most visually stunning movies I’ve ever seen. Multiple times I had to pick my jaw up from the floor as I stared dumbly at a gorgeous landscape, or a slow motion shot of horses and riders breaking through a thick fog. However, the entire picture is not nearly as stunning as the visuals. I’ll be the first to admit that I’m not well versed in Chinese history, so naturally a period piece going back over 2000 years in time may be a little inaccessible for North American audiences who are most likely in a similar position to myself. But that doesn’t mean I’m not in a position to enjoy the story being told, even if it is a little confusing. Fortunately The Last Supper is fairly easy to follow, remarkably so considering the huge cast of characters. The problem is that the central character, Liu Bang, is borderline despicable without actually becoming a villain. A protagonist with many flaws, we spend a lot of time with Liu Bang as his mind erodes. It was very difficult to feel anything for this man. On the other hand, there are a number of other characters who have dedicated themselves to Liu Bang and may have hearts or minds that audiences could identify with. Unfortunately we spend far too much time with Liu Bang and his equally unlikeable wife, and not nearly enough time with the other characters. So when they are eventually dispatched by the paranoid couple, it is again hard to feel much of anything. Watching The Last Supper felt like staring at a very beautiful piece of art for a very long time. It’s clear that a lot of passion was put into making this film, and Lu Chuan’s visual genius is undeniable. However, it’s a shame that more work was not put into the characters or how the story was told. The Last Supper is ambitious and gorgeous, but it’s also too impersonal. It definitely feels much more like a history lesson than a secret window into the last years of Liu Bang’s life.